Tottenham faces the very real prospect of losing Son Heung-min for two full Premier League seasons. This is due to South Korea still being at war with the North, the consequences of this are that the country still applies compulsory military service. The rule is that every South Korean male aged between 21-28 considered fit and healthy are required to complete 21 months of military service. Any person who fails to complete the required conscription risks the possibility of facing being charged with desertion and would highly likely be looking at jail time. The issue of mandatory military service is an extremely sensitive issue for South Koreans, especially in regards to celebrities, the extremely affluent, or those citizens holding dual nationality. There have been numerous controversies in the past with celebrities finding a way to avoid the draft. The tried and trusted tactic they have been known to resort to was bribing doctors to tamper with their tests or renounce their Korean nationality, preferring to select the side of their dual nationality which does not include compulsory national service. Dual nationality in Korea is not accepted once you turn 18, it is required that all dual nationals select their nationality before they’re 18. A failure to select nationality before that point would mean that said person will still have to complete the national service. The South Korean public is sensitive towards military service but has a low tolerance for those who attempt to avoid it or receive special treatment. Especially after past scandals involving celebrities and wealthy families. In 2002, Korean-American pop singer Steve Yao changed his nationality just before he was due to be drafted and fled to America. He has since been banned from entering South Korea permanently, and he has been begging South Korea to let him back into the country for 10 years. In 2004, actor Song Seung Heon avoided the draft by taking medication to fail the military exam. In 2011 rapper Mc Mong was sentenced to 6 months in jail for deliberately delaying his national service by pulling out two teeth. Due to the previous scandals involving celebrities attempting to delay or dodge the draft, the Korean government changed the law to make it fairer. Although it looks like Tottenham and Son Heung-min has zero chance of succeeding in their attempt to request a delay. Have they try and find a way to get Son Heung-min out of his national service. There is still the chance of a get out clause for Tottenham and Son to gain an exemption from being drafted. This, however, would require Son to win a gold medal at the Asian Games, not the Asian Cup or by getting to the World Cup semi-finals as was stated by the Sun newspaper in England. South Korea actually won the Asian Games in 2014 and Son would have been in that squad if it were not for Bayer Leverkusen refusing to allow him to play in that competition. Therefore he didn’t get a gold medal and didn’t receive the exemption. 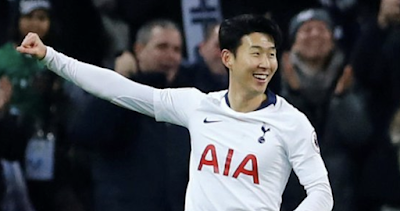 If Spurs are smart unlike Leverkusen they will release him to compete in the next Asian Games and pray that South Korea win otherwise they risk sending a multimillion pound asset to the Korean army for 21 months. If Son does end up having to join the army, then fear not; as he won’t be standing guard at the demilitarised zone. Son would most likely be sent to join the army’s football team – Sangju Sanmu. Which would mean Tottenham would be forced into loaning a key squad member to the Korean army team for two seasons due to the South Korean law. If Son was going to try to avoid the draft then he would possibly run the risk of facing any of the punishments handed out to the other celebrities who have previously attempted to avoid the this. Now it is said by celebrities in South Korea it is better to get it over and done with rather than trying to find a way out of it, or delaying it until your career is near its end. Tottenham will then have no option but to allow him to go and represent Korea in the Asian Games even though it is generally considered a minor tournament in regards to other football competitions he has the possibility of featuring in. Tottenham and their fans will be praying to any god who is willing to listen that he wins gold, especially considering the current run of form he has been having. If he does win a gold medal then he would just have to complete 4 months intense military training and this would be the ideal outcome for his club.